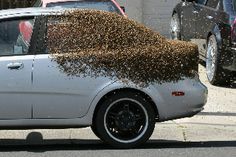 A swarm of bees sometimes frightens people, though the bees are usually not aggressive at this stage of their life cycle. This is principally due to the lack of brood (developing bees) to defend, and their interest in finding a new nesting location for their queen. 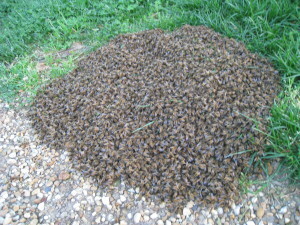 Swarming is the natural means of reproduction of honey bee colonies. Please note that wasps and hornets are often mistaken for bees. 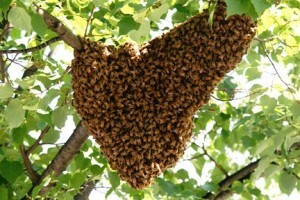 Our members do not exterminate/Remove any insect other than Honey bees. Please refer to a professional exterminator if you have any insect in the wasp/hornet family. What Type of Bee/Wasp Problem Do You Have? 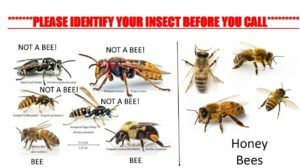 These photos and descriptions of different types of bees, wasps, and hornets will help you accurately relay your stinging insect problem to a beekeeper so that he/she may better assist you when you call. Remember, “your bee” may not look exactly like the photo; simply try to find the bee that looks the closest. 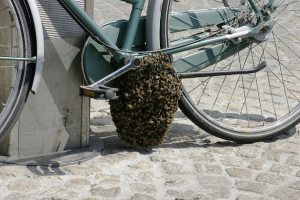 Have a swarm? We have members who remove swarms from trees, fences, the ground, and buildings.